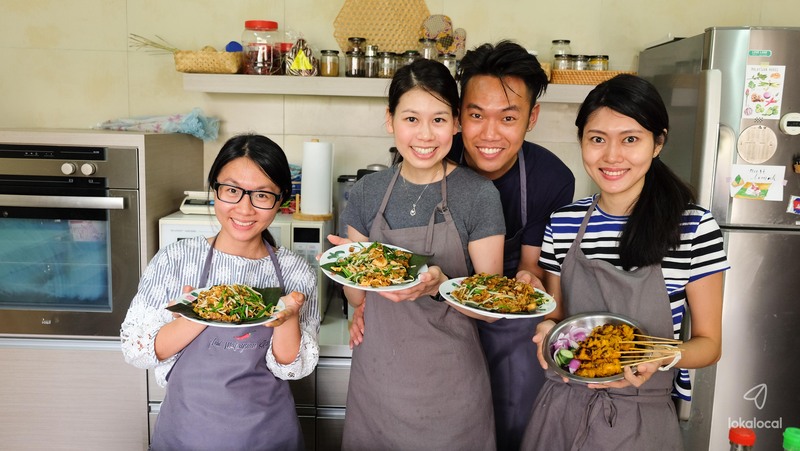 Learn to cook two of Malaysia's most popular street food - Char Koay Teow and Chicken Satay with Peanut Sauce - with Sara Khong, author of four cookbooks. Char Koay Teow literally means 'fried flat rice noodles'. Typically fried with pork lard on high heat and umami-rich local seasonings, this dish is a favourite among Malaysians, cooked with accompanying ingredients of chives, bean sprouts, prawns, Chinese sausage, and crispy pork lard. In this class, you will learn how to cook this delectable Chinese street food. This dish will be paired with satay, another well known street food which consists of seasoned and grilled meat. Learn how to marinade the chicken with spices and poke them into bamboo skewers, then make a lemongrass brush to oil the satay and give it extra fragrance during grilling. You will also receive printed recipes so that you could recreate these at home. Lastly, enjoy a delicious meal together with Sara while hearing stories of the Malaysian way of life. Begin with a glass of tea before we explore my edible garden with over 50 herbs, spices, and flowers used in everyday cooking. We will see, touch, smell, and taste a variety of local plants like curry leaves and turmeric. Then, we'll proceed to the kitchen to make two popular Malaysian dishes, with some ingredients from the garden. Lastly, enjoy a delicious meal together with me while hearing stories of the Malaysian way of life. Like the garden guide tour to know more about edible food. Truly know about the ingredient and the atmosphere is very good. Clean and tidy. Good food and Sara is pretty and knowledgeable. A wide variety of food in this cooking school. Very home feeling. Authentic taste with our own judgement of some of the taste e.g. amount of condensed milk in teh. Sara is very caring that when we cooked banana fritters, she demonstrated first and keep reminding us to be careful. Sara is also very opened to opinion and suggestion, you can join her class and suggest what to cook, she's very flexible.